How does an Angeleno beat the July heat? Head out to one of these (mostly) free music residencies. In addition to playing free gigs all month, HOTT MT will also be giving away freebies—like links to videos (accessible only with a password) and new songs—to those who attend. 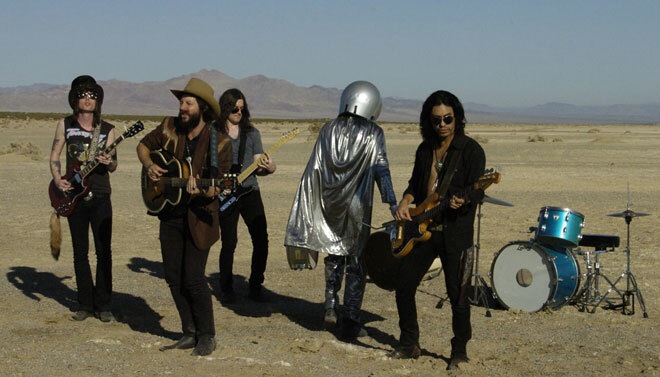 The band’s biggest success to date was getting Wayne Coyne of the Flaming Lips to guest on one of their songs after they showed up, unannounced, on his doorstep. For the fivesome, this week’s residency performance will only be their second-biggest gig; MT OSSA will open for Todd Rundgren (of “Bang the Drum All Day” fame) in Orange County on July 8. The band’s newest album, Homework Machine, can be streamed in its entirety on Soundcloud. The band last went into residence at Hollywood bar Harvard & Stone in September of 2012. Since then, it has been at work on a new album that was originally slated for July. It also added singer and guitarist Bryce Wayt to its lineup in late April. The husband-and-wife duo of Justin and Kate Miner, along with friends and relatives, played the taste-making School Night party at Bardot on April 1 this year along with a gig at San Francisco’s Noise Pop Festival. It’s a lot for a group that played its first live show in October of 2012. Think: The folk-rock Mumford and Sons coupled with the exuberance of Edward Sharpe and the Magnetic Zeros. From September through December of last year, the L.A.-based septet released one song per month while frequently playing local clubs (El Cid, Good Hurt, etc.). Expect more sweet vocal harmonies and Beach Boys-esque indie pop. Between being featured on the soundtrack to the indie film Struck by Lightning and writing new material Van London had a busy spring. His latest single, “Baby I’m Here For You,” features Gretchen Bonaduce (Danny Bonaduce wife #2 for those keeping track). Previous articleWho Murdered UCLA Medical Center Nurse Melanie Howell? Next articleGirl Talk: What it Means to Be a Female Bartender in L.A.